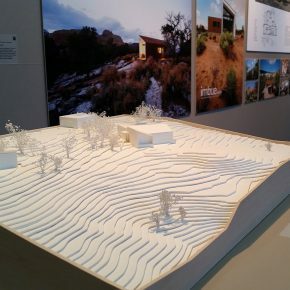 The Utah Division of Arts & Museum’s annual Design Arts Utah show proves once again the continued growth of talent and ingenuity in Utah. 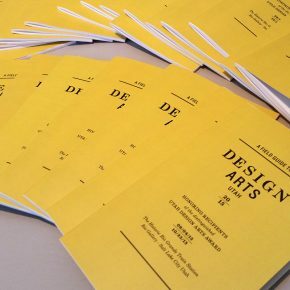 Collected among the juried designers we find students with an eye on the future and established creatives who continue to push boundaries and exercise their skill set boldly and attentively. Additionally, we’re given an insight into the practical nature of much of our design work. 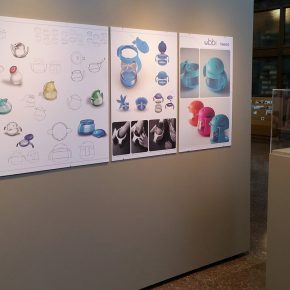 Product design and embellishment are featured in the selections, highlighting the growth of entrepreneurial spirit in Utah and the design opportunities developing from it. Of particular note are the Juror’s Awards in the Student category. 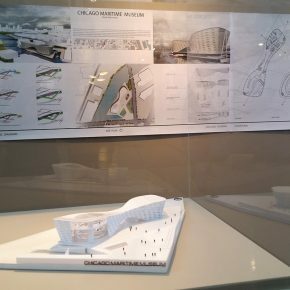 Massih Nilforoushan, an architect and student at the University of Utah, envisions a fluid new structure for the Maritime Museum on the Chicago River: the building itself seems to flow with the river, while the paneled exterior evokes the hull of a great ship, all with a form that abstains from becoming an amusement. 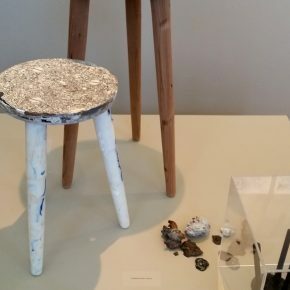 Meanwhile, Carter Zufelt, of the Brigham Young University Industrial Design program utilizes hundreds of plastic bags to create a beautiful multicolored combination of form and function in his “HDPE Milk Stool and Side Table.” Both efforts draw attention to the preservation of history and attention to the environment that our state fosters. This theme of awareness and valuation of environmental concerns is further embodied in the Juror’s Award winner in the professional category, “This is Green River,” created by Maria Sykes, Steph Crabtree, Nicole Lavelle, Taryn Cowart, Pete Collard, and Alice Masters. 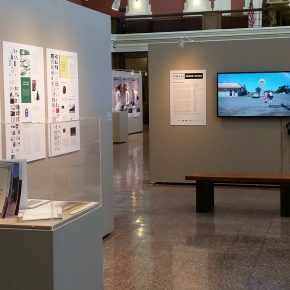 The work creates a collection of “stories” that invite the viewer to not only learn about the intricate history of the small town in the Colorado Plateau, but to become connected to it through the use of personal stories, photos, and videos. Through it we gain a better recognition of the town, its people and the impact they have on our state. 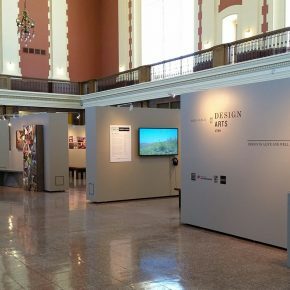 Other works in the show demonstrate how designers in Utah are able to step outside of the conventional clientele. 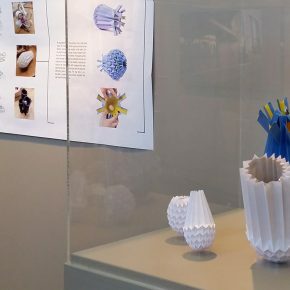 Kathy Tran’s “Origami Egg Drop” is a beautiful object in and of itself, but also carries with it the added feature of being able to protect an egg dropped from significant height. Further showcasing functional and aesthetically pleasing design is the “NUR Bench” by the Plastik Banana Design Werkshop, which utilizes both modern and traditional building methods. “M3 – Modular Furniture” by Stefan Leimer, also brings this method into play by creating functional home decor that saves space and production cost. 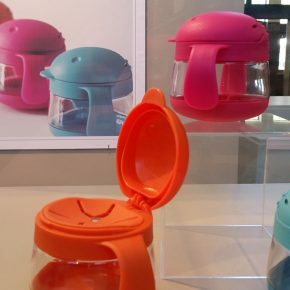 Utah’s continued growth brings new insight and creativity in the design we produce and the impressive showing at this year’s Design Arts Utah showcases that progress and serves to give us confidence in the skill, talent, and innovation to come. 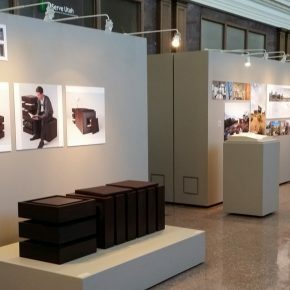 DesignArts Utah 2015 is at the Rio Gallery, 300 South Rio Grande Street (455 West), Salt Lake City, through October 18. Hours: Mon-Fri 8 a.m.-5 p.m. A closing reception is Oct. 18, 6-9 pm.